During the Holiday Gift Guides I am always amazed at the phenomenal products that the direct sales industry has to offer. There is never any doubt in my mind that we have the best products, at the best price, being sold by the best people in the World. This was even further solidified when I opened the package from Independent Tocara Representative Suzanne DiLazzaro. Daring to do things differently because it is time to do things differently, is a challenge. Founders Randall Markus and David Sigal have over the past 30 years used this principle to create one of North America’s most successful fine jewelry design and manufacturing businesses. They founded Tocara to create a line of exclusive fine jewelry marketed direct to customers through independent Consultants. Each exclusive Tocara product has designer styling and quality at affordable prices. The pieces are breathtakingly beautiful – something you would expect to spend a fortune on in a jewelry store. The Collection includes the necklace and earring set – both with Swarovski® Crystal Pearls and Tocara’s exclusive DiAmi® stones in a Rhodium setting. Pictures simply can not do this set justice. At Tocara©, our goal is to constantly challenge ourselves to do those things that first meet the needs of our Customers and our Consultants. All of our business decisions are designed with the goal to minimize the “can not’s” that often creep into organizations because “that’s the way things are done”. From the beginning we strive to develop an environment that maximizes the TOCARA experience. When you challenge conventional wisdom, you often stand apart. At Tocara©, standing apart means striving to be the best. It is what we are all about, a direct seller of fine jewelry with a touch of something special. 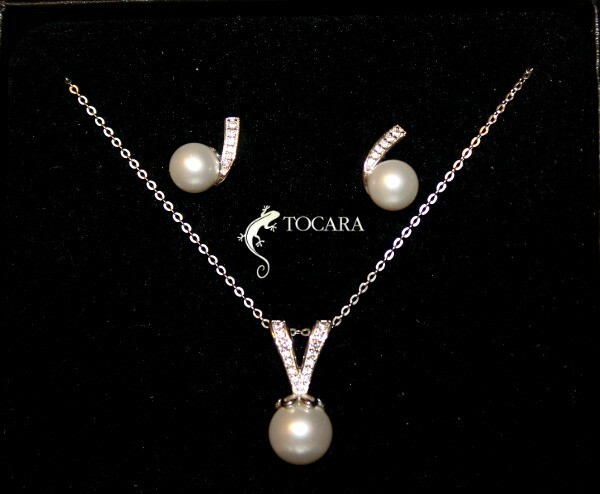 Tocara’s Natacha Crystal Pearl Collection can be dressed up or dressed down. It is elegant enough to compliment a ball gown (or in my case – wedding dress) but fashionable enough to be worn with jeans and heels. You can check out everything Tocara has to offer by visiting Suzanne’s website.